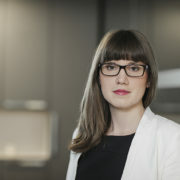 Selih & Partners Law Firm is pleased to announce that Jera Majzelj has become the firm’s new partner. Jera joined Selih & Partners in 2012 and has since gained a wide range of experience in all aspects of M&A transactions across several sectors as well as in other practice areas. Aside from M&A, she is part of the firm’s antitrust practice and corporate and commercial law practice, but also advises clients on banking, finance and capital markets matters, particularly those involving a cross-border element. She has proven invaluable in assisting in the most complex transactions and is very much praised by the clients who recognize her as having great communication skills and analysing encountered issues with great care and precision.